Your local supermarket puts a huge variety of produce at your fingertips, no matter what season it is. But there’s a way of eating that not only tastes better but is also better for your body! 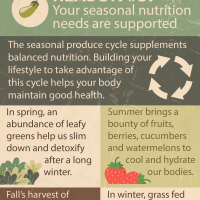 Here’s reason #5 why farm fresh is best: Your nutritional needs are supported. When you buy from a farmer, you’re building your lifestyle around the natural produce cycle while supporting your health goals.